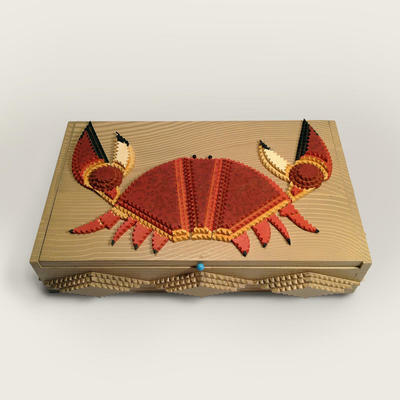 Made from a cigar box and features a crab on the lid and a diamond motif on the sides. The lid lifts open to reveal an interior that is painted and the bottom has the words "Get Cracking". The interior also has some sand and two vintage "crackers" found in Maine and ready to be displayed or used at your next lobster or crab feast. Approximately75 hand-cut and carved pieces of wood were used in creating this one-of-a-kind work of art.